Press Sample The closer we get to summer the more summer collections start popping up on my to do list. On today's menu is SpaRitual's Reflect Collection for Summer 2013. I usually gravitate towards neons or anything bright in the summer (or any other time of the year actually) so I had a hard time understanding why a company would release anything else for the summer months. Then I read SpaRitual's press release for the Reflect collection and the color choices made perfect sense. "The Reflect Nail Lacquer Collection is inspired by the glowing jewel-tone of late summer afternoons and the fleeting shimmer of sunlight across the water and sky as the sun sets the horizon." 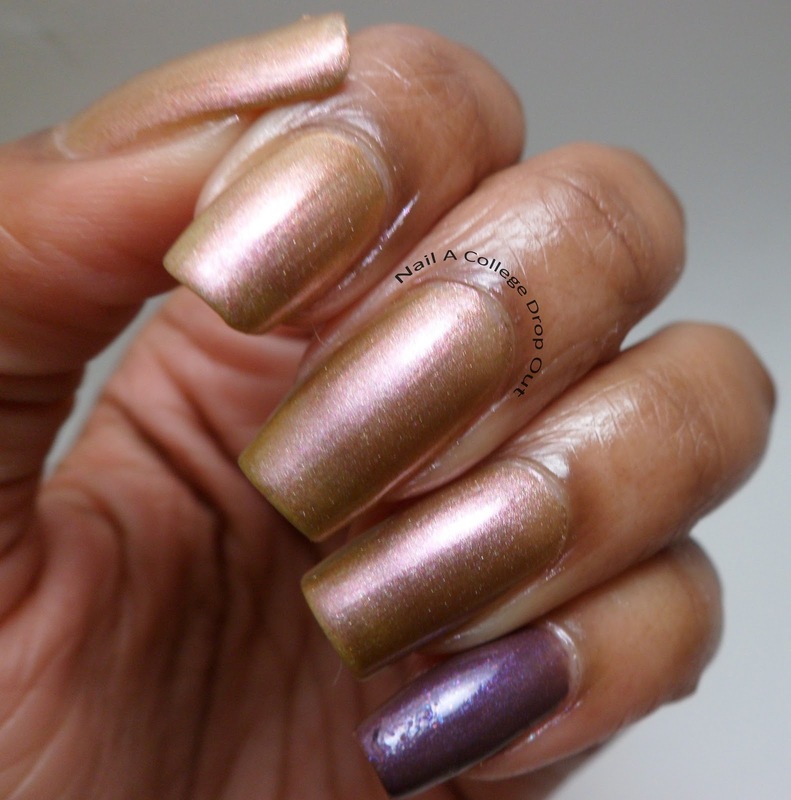 As the title suggests, I've got a few different way to wear accent nails using these shade. So let us begin shall we? How about double accent nails using Joy on my index and middle fingers and Innocence on the rest. Joy is a neutral beige with hints of gold, silver, and opalescent shimmer that is opaque in three coats. While Innocence is a muted mauve (possibly putty?) creme that is opaque in two coats. If I had to choose a favorite from this combo, I'd be torn down the middle. I love a good creme (innocence), but for some reason the neutral with shimmer (Joy) is calling my name. Why not keep playing around with double accent nails and move them to the index and pinky? I decided to go with Kindness as the accent and Positive Vibe for the remaining fingers. Kindness is a fiery orange with gold shimmer that is opaque in three smooth coats. At the same time, Positive Vibe is described by SpaRitual as a orange hue. However, I see it as a yellow creme that teeters the line between Dijon mustard and peanut butter that reaches full opacity in two coats. Yes, I am hungry, but at least I'm descriptive right? Right. Again, if I had to choose one out of this combo, yet again, I'd be cleaved. I love cremes (Positive Vibe), but I love just about any polish with gold in it (Kindness). When in doubt, pinky out! For the third and final accent manicure I choose Freedom (pinky) and Inner Beauty (remaining fingers). Inner Beauty is a copper shimmer that is actually very sheer. The look you see above took five coats to obtain. So if you're going for a softer look, this is the shade for you. Freedom, as stated by the SpaRitual press release, as a rich brown. For me it is a purple shimmer with glints of pink and blue micro glitter. Choosing between the two of these was easy. Freedom, hands down favorite! I should probably mention it is opaque in two coats. Beneath is a screen shot of the press release I was sent so you can read SpaRituals color descriptions yourself. The Reflect collection retails for $12.00 each at select spa and retail locations through out the country, including online at Pharamaca.com and Beauty.com. For much more info visit SpaRitual.com. Have you been dabbling in the world of accent nails? Look how long your nails have gotten! Gorgeous swatches! I love Positive Vibe! Oooh love the nudes, especially the shimmmer!